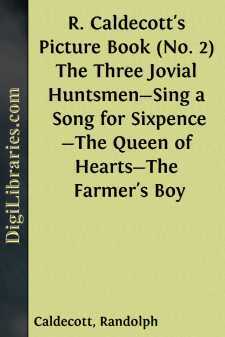 TheTHREE JOVIAL HUNTSMEN. IT'S of three jovial huntsmen, an' a hunting they did go;An' they hunted, an' they hollo'd, an' they blew their horns alsoLook ye there! An' one said, "Mind yo'r e'en, an' keep yo'r noses reet i' th' windAn' then, by scent or seet, we'll leet o' summat to our mind. "Look ye there! They hunted, an' they hollo'd, an' the first thing they did findWas a tatter't boggart, in a field, an' that they left behind.Look ye there!One said it was a boggart, an' another he said "Nay;It's just a ge'man-farmer, that has gone an' lost his way. "Look ye there! They hunted, an' they hollo'd, an' the next thing they did findWas a gruntin', grindin' grindlestone, an' that they left behind.Look ye there!One said it was a grindlestone, another he said "Nay;It's nought but an' owd fossil cheese, that somebody's roll't away. "Look ye there! They hunted, an' they hollo'd, an' the next thing they did findWas a bull-calf in a pin-fold, an' that, too, they left behind.Look ye there!One said it was a bull-calf, an' another he said "Nay;It's just a painted jackass, that has never larnt to bray. "Look ye there! They hunted, an they hollo'd, an' the next thing they did findWas a two-three children leaving school, an' these they left behind.Look ye there!One said that they were children, but another he said "Nay;They're no' but little angels, so we'll leave 'em to their play. "Look ye there! They hunted, an' they hollo'd, an' the next thing they did findWas a fat pig smiling in a ditch, an' that, too, they left behind.Look ye there!One said it was a fat pig, but another he said "Nay;It's just a Lunnon Alderman, whose clothes are stole away. "Look ye there! They hunted, an' they hollo'd, an' the next thing they did findWas two young lovers in a lane, an' these they left behind.Look ye there!One said that they were lovers, but another he said "Nay;They're two poor wanderin' lunatics—come, let us go away. "Look ye there! So they hunted, and they hollo'd, till the setting of the sun;An' they'd nought to bring away at last, when th' huntin'-day was done.Look ye there!Then one unto the other said, "This huntin' doesn't pay;But we'n powler't up an' down a bit, an' had a rattlin' day. "Look ye there! But there came a Jenny Wrenand popped it on again.